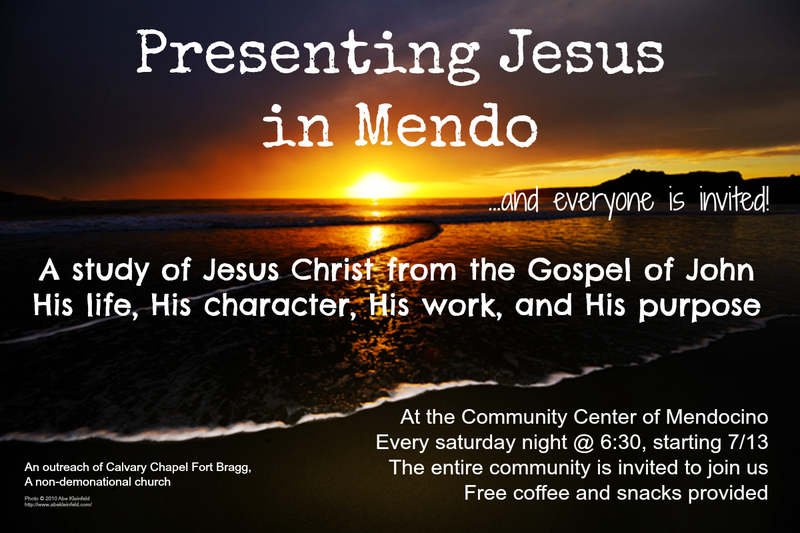 Hey everyone, we are going to be “Presenting Jesus in Mendo” starting Saturday 7/13. I will be leading a study in the life and character of Jesus Christ as we go through the Gospel of John at the Community Center of Mendocino every Saturday night at 6:30. We’re going to meet in the beautiful Curry Community Room. The whole community is invited, and I love to see old friends, church family, and many others from every walk of life attend as we look at the most amazing person in the history of the world. We’ll have free coffee and some snacks too. Hope to see you there! !